In Beijing, there are 30 parks which have Nordic walking clubs. More than 100 government units and companies organize walk training for their employees. It was also introduced in 2008 Beijing Olympic promotion events, and in 2010, Nordic walking orienteering was part of China Orienteering Competition. Since 2008, Beijing has been annually organizing an International Nordic Walking Event with over 1,000 participants each time, including walkers from the Japan Nordic Walking Association and from Finland. 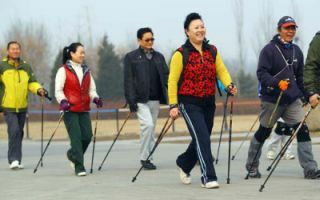 "Nordic walking is becoming a popular park game, or exercise for Chinese people," said Yao Xinxin, head coach of the International Nordic Walking Association in China. As a sports science specialist at the China Institute of Sport Science, he was the one who first introduced Nordic Walking to China.